Acorn may sadly be no more than a brand name attached to fairly generic netbooks now, but Acorn's products are thriving. The Acorn RISC Machine, later renamed the Advanced RISC Machine once VLSI and Apple got involved, is one of the greatest British technology successes ever. ARM is the world's most successful processor – ARM's partners had shipped over ten billion units by the start of 2008, dwarfing the x86 market. But even today, the ARM chip's original OS is still chugging along. RISC OS is experiencing more development than it has in years. The "official" version from RISC OS Ltd, mainly sold as an upgrade for old Acorn machines, is going nowhere fast, but the other fork, Castle Technology's RISC OS 5, has been released under a shared-source licence agreement and has transformed into RISC OS Open. RISC OS 5 was built specifically for the Castle's Iyonix computer, based on a 600MHz Intel XScale 80321. RISC OS Open Ltd, affectionately known as ROOL, are reworking it for other hardware, including the last Acorn model, the RiscPC – and a small ARM development platform called the Beagleboard. There are several small, inexpensive development devices that get electronics wonks all excited, such as the Arduino, based on an Atmel AVR microcontroller. It's great for embedding into all sorts of devices, if that's your personal thing. 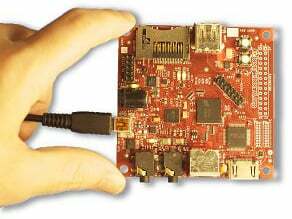 The Beagleboard is a little different. Mainly this is due to its specification: an 720MHz ARM CPU, along with a DSP and PowerVR graphics, plus 256MB of RAM, a USB port, an HDMI port and SD/MMC slot. In other words, a capable little self-contained PC. Most Beagleboards run Linux – there's even a version of Ubuntu available for it – but it's quite low-spec for a desktop system. Ports of other ARM operating systems are in progress, too, including QNX and Symbian. 256MB of RAM is plenty for RISC OS, though, and it goes like stink on the device.